That’s the truth, and I love how modern Omegas look: modern. 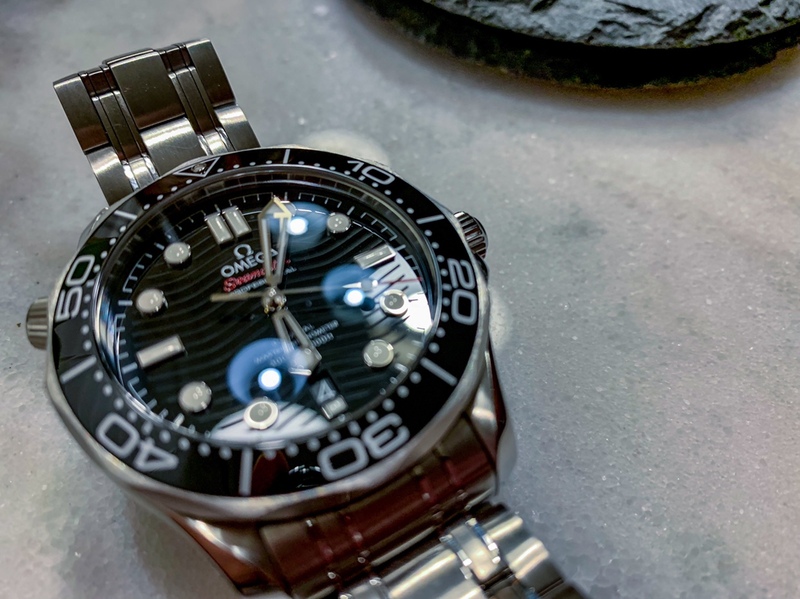 The issue is money isn’t an unlimited resource and every time Omega refreshes a model, the old one becomes more obscure/undesirable and there goes its resale value. I'm a very long time lurker/reader, but this is my first post. I would actually like to thank all of the active users on this forum for the info and perspective they provide. Since I was a young man, I have loved the look of the SMP. Despite not being a huge fan of the JB films in which it was originally featured, the watch resonated with me. 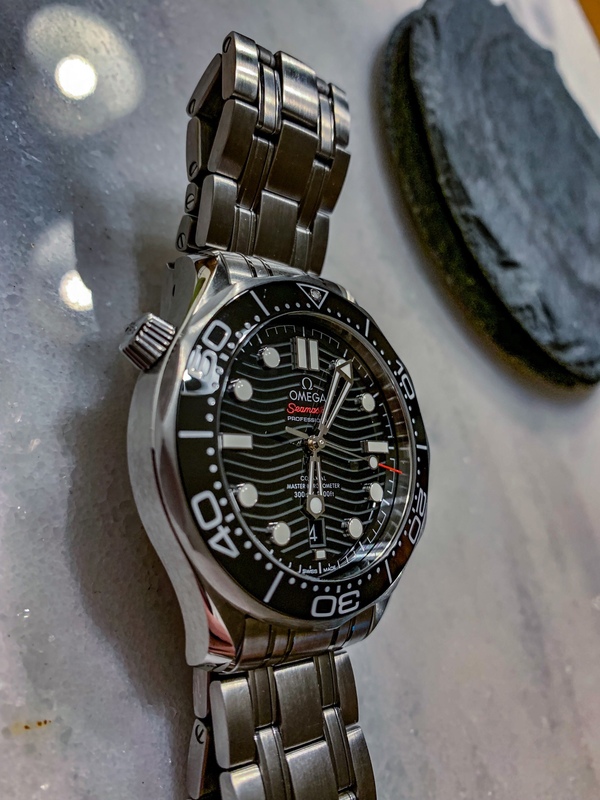 Fast forward to a few years back and one of my best friends found a 50th anniversary GMT (sword hands) in fantastic condition and it shook me. Every time I see him, off canned my Seiko Kinetic Tuna and on went that watch. 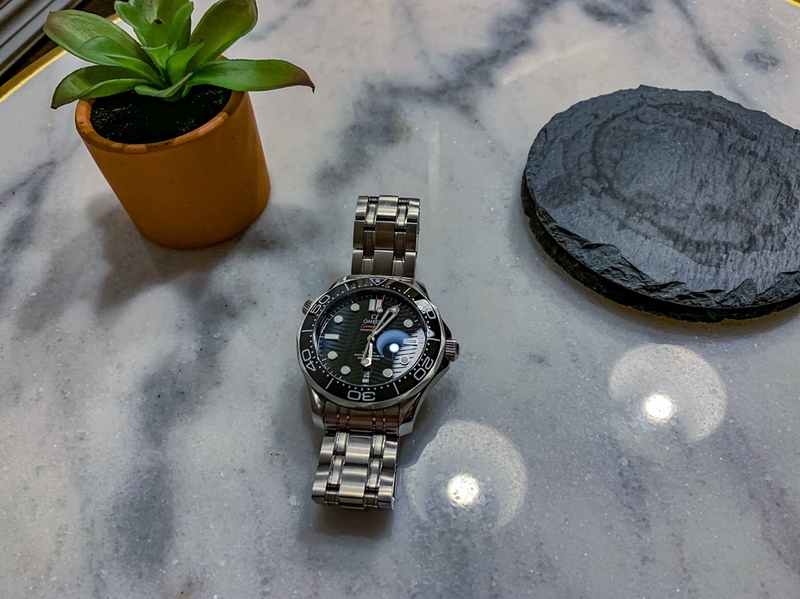 He was always kind enough to say nice things about the tool diver that he got handed (I DO love my Seiko SUN). Fast forward some more to a few days before Christmas 2018 and I was in an AD closing this deal. Lol. I tried all the AT's (loved them and I will own one), a Railmaster (a tiny bit too much vintage aestheticfor me), and all three of the non-gold SMP's (black, sincere, and blue face). The black really spoke to me with the red accents on the dial. 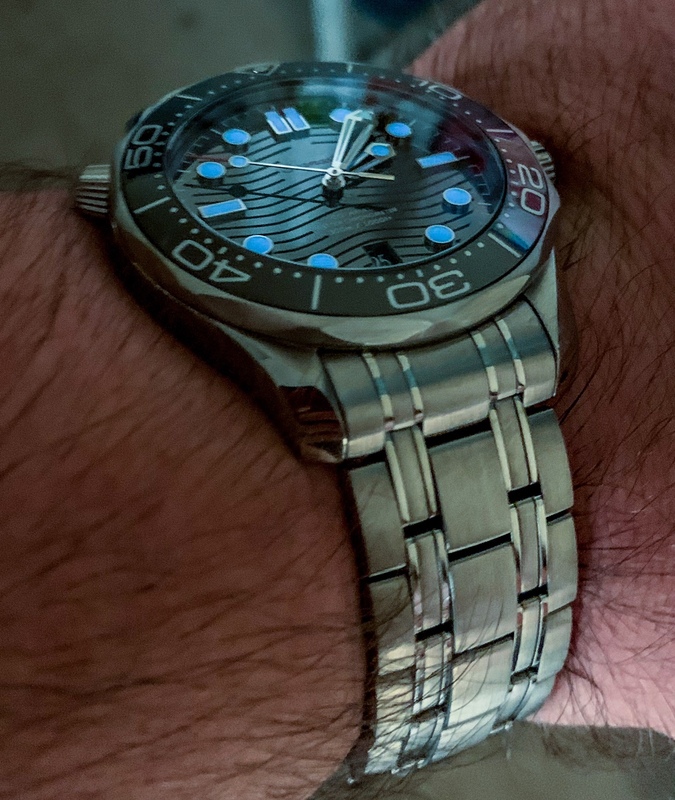 While wearing the blue, it was VERY handsome but I found myself wishing that the blue was darker (closer to Navy or Cobalt blue), like the earlier 2500 caliber watch. The silver also looked absolutely incredible, but lacked any color accent that contrasted with the face like the red-on-black. So the AD and I agreed on a 10% discount on the last black-on-bracelet in the store and I left a happy man. When storing it 6 o'clock down overnight, I'm getting right around .1-.2 seconds fast per day using WatchTracker on iOS. Though, admittedly, the watch is accurate enough to have my error in syncing the second hand to potentially play a role in the measurement. 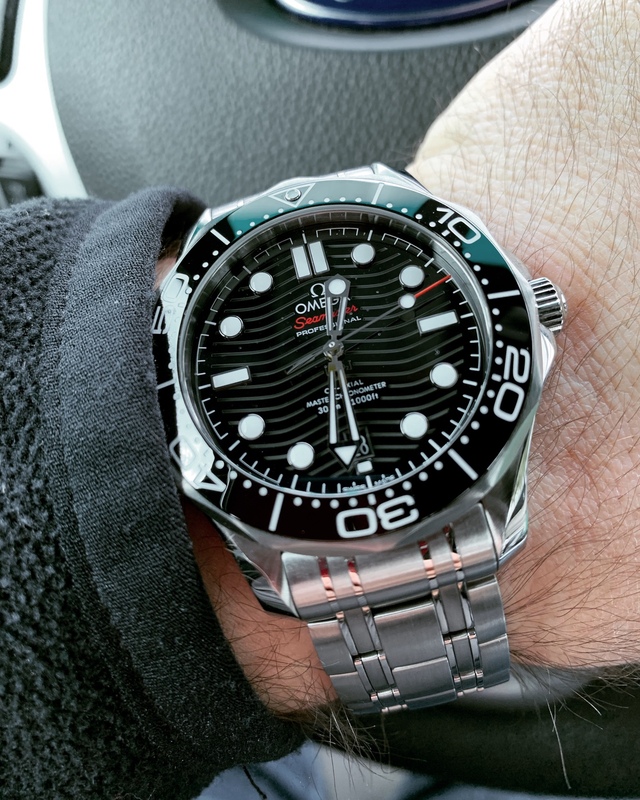 The bracelet is fantastically comfortable, easily equaling my previous most comfy watch, a 1995-96 Tag Se/L quartz with that famous/infamous S-Link band. I've repeatedly forgotten the SMP was on my wrist; a feat for a watch that isn't light in the std sense. The quick adjust feature is also 100% the future; I am able to wear the bracelet tighter (yet with 100% comfort) throughout the day. I don't have to pick one setting and learn to live with it. Further, it comes with two sets of half links (one on either side of the clasp). And, personally, I simply adore the look of the SMP bracelet. I'll be snagging a rubber strap later on for potential summer use. The way that light plays and interacts with the dial is really fantastic. It's like getting a different, yet complimentary, version of the watch face every time you walk into a different room. With the laser engraved waves having a matte microtexture, they can look inky black or matte light grey. They can transform in this manner even in direct sunlight. The display case back is also a wonderful little treat that I really love. Is it an unnecessary frivolity? Of course it is! So is having more than a G-Shock or Timex on your wrist. I dig it. And I'm willing to have a slightly thicker case to get it. End of story. 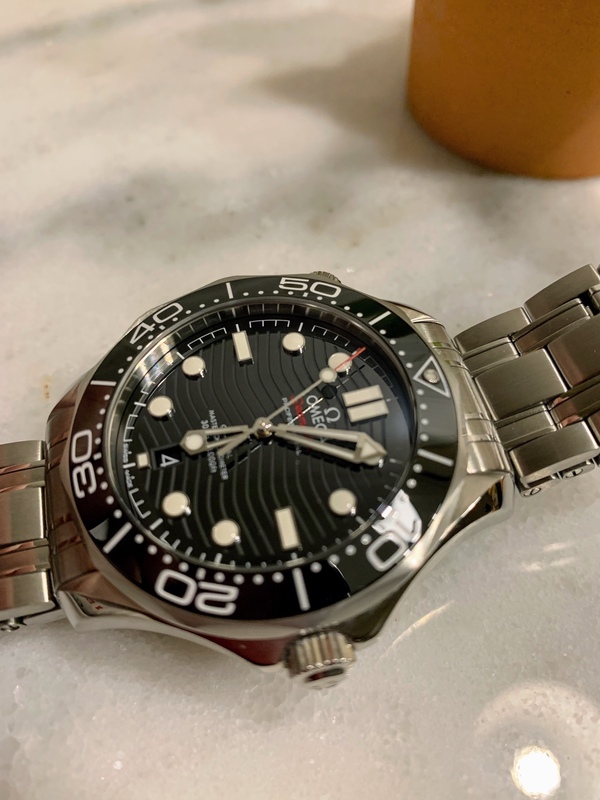 As my first luxury watch purchase, the entire process felt special. Thanks in large part to one of my best buddies (Ian you rock!) and not in small part to this forum. I went in prepared in what to look for, what to expect, and realistic expectations. My AD reciprocated and the experience couldn't have been smoother. Many thanks for those here that share such good info. Side by side with my buddy's 50th Anniversary GMT SMP, the watches are clearly brothers of the same parents. 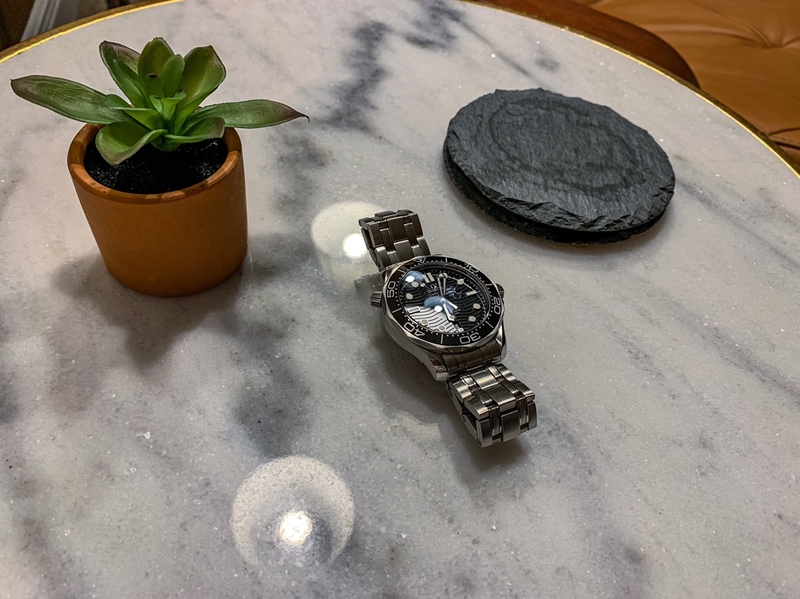 The cases are so close in size, when my bud and I traded watches for a few minutes, we got to talking about the Rolex Daytona bubble and we both, out loud, admitted that we forgot we were wearing the other's watch. On the same wrist, their diameter is difficult to differentiate by eye. Though mine is clearly thicker in profile, it's also still very close. The lineage is really striking and I just love that a non-watch-person might not be able to tell which is newer, or even that they're different, depending on the angle. Congrats and awesome review/post. The new black SMP is a great all arounder. 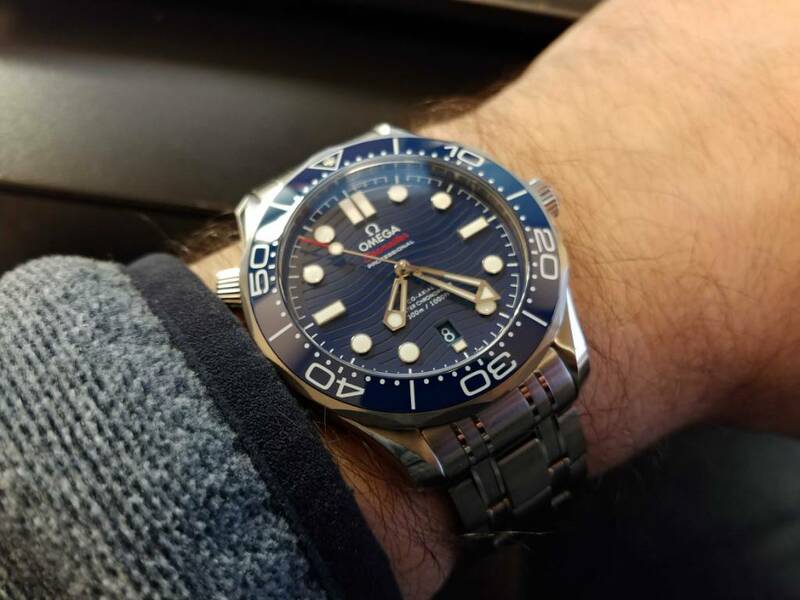 I just bought the blue dial this past weekend but I was torn between the black and blue. I went blue to add some variety to my black dial watch collection and am loving it. In normal lighting it really comes off as more navy blue. I have a flat 7 inch wrist and it fits me like a glove. The bracelet is a great fit and I really like the adjustable clasp. 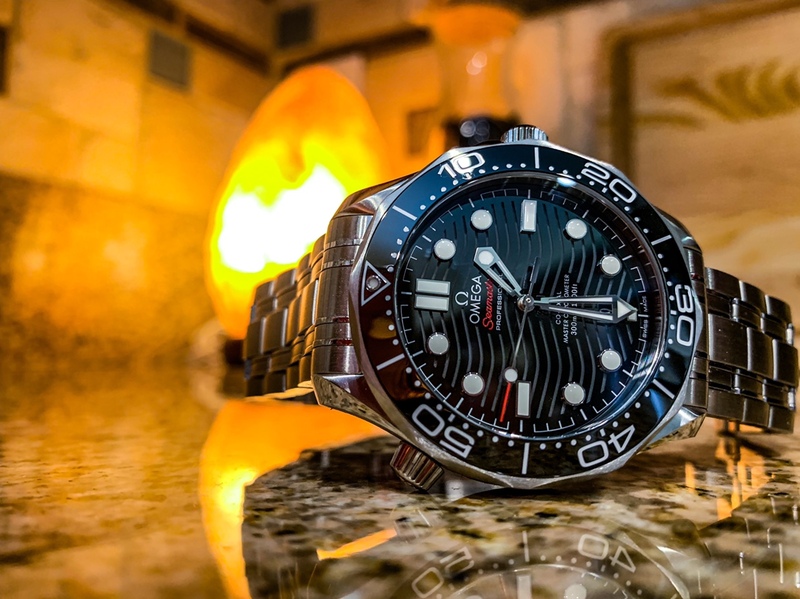 I think it wears very similar to a 2500 Planet Ocean which was great. To me it has the right balance of wrist presence and comfort. It looks stunning. But, they made it bigger. Apparently 43mm. That's going the wrong direction IMHO. I think this will wear unexpectedly nice when you factor in the (lack of)weight of the ceramic case. And black is slimming, after all. Good point. I forgot about the weight reduction. I would ADORE a GMT in this line. Omega, DO YOU HEAR ME?!? 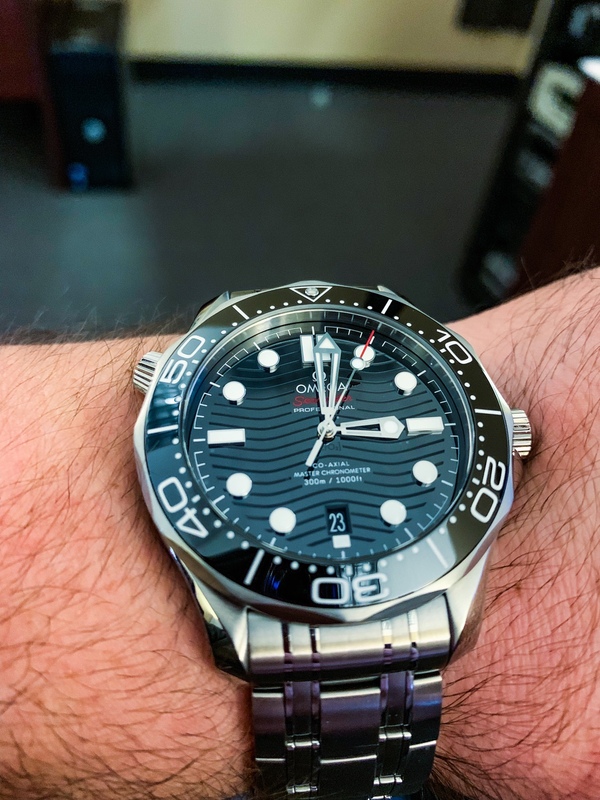 Friday lume shot in the break room. Cybotron, Dino7, boatswain and 2 others like this. The black and red really do it for me. Been the best GADA watch I've ever had. boatswain, Dohnut, plibber and 2 others like this.